Wanneer gebruik je de plaksnor? Who does not know him? The Johan Derksen mustache with which he is notorious for his television program Voetbal International on RTL7. When you have a nice party to celebrate, nothing is more fun than to imitate Johan Derksen, because of his famous Football International mustache. For example, during a bachelor party when you wear a mustache of a celebrity with all the boys, then the Johan Derksen mustache is the ultimate opportunity to create a unique personality. The Johan Derksen mustache is of course known for his big mustache which you also regularly find on walruses. However, the television program indicates that it never smells like rotten fish. For that reason alone it would be great fun to purchase a Soccer International Mustache via plaksnor.com . Because everyone will recognize Johan Derksen in it. Yet Johan Derksen also serves a good cause with his mustache. Because every year, in the month of November, he supports the research into prostate cancer with his mustache. And someone who has such a special mustache can of course do that like no other. 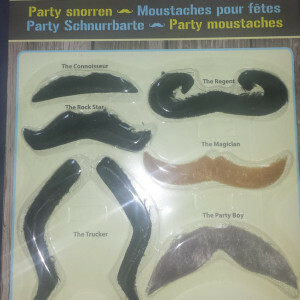 On the website plaksnor.com there are mustaches for sale for every occasion. You can also purchase the Johan Derksen mustache. When you order it today via the website, you have the mustache within 2 working days. You can at least be happy with it on a fun outing or party. And if you want to order several Johan Derksen mustaches, that is no problem at all. Because you can also buy them in sets of 6 or 12 pieces . That is of course also much cheaper. So place your order today on the website plaksnor.com for a mustache Johan Derksen. Order your Johan Derksen Mustache here, complete set including the Johan Derksen Mustache!